Australia is home to some of the biggest tourist cities in the world - Sydney, Melbourne, and the Gold Coast are the most popular destinations. But Australia's best kept secret is the South Australian capital - Adelaide. Adelaide is the gateway to many of Australia's top tourist destinations. Below we list our five favourite destinations that are just a stoneâs throw away from Adelaide. 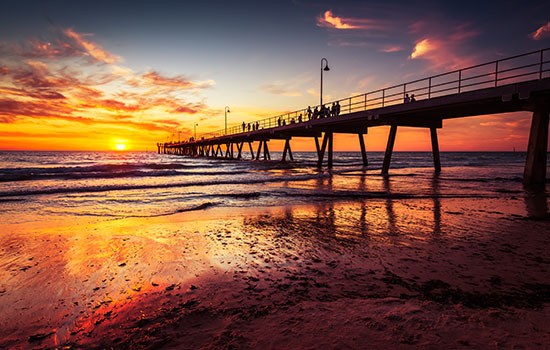 The seaside village of Glenelg is just a 25 minute tram ride from the centre of Adelaide. Glenelg is absolutely bursting with places to eat from charming cafes to fine-dining restaurants. But before you grab a bite, there are plenty of things to do! You can have a nice relaxing dip in the ocean as the calm waves roll in or have a sunbake on the warm sand. You can take a fishing rod and cast line out over the Glenelg Jetty. There's even The Beachhouse Amusement Park which is an indoor extravaganza of water slides, a mini golf course, and an arcade. If you're after a more daring adventure you can catch a sailing boat out into the ocean and swim with the dolphins! The trip takes around four hours and departs from Glenelg Beach. 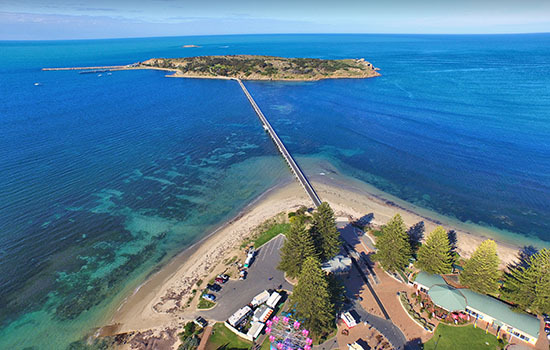 Along the Fleurieu Peninsula, just an hour's drive from Adelaide, you will find Victor Harbour. Victor Harbour is a sleepy coastal town which overlooks Encounter Bay. From Victor Habour you can board a cruise which will take you out over the ocean to go whale watching. You can also visit Granite Island out on the bay by taking a horse-drawn carriage over the wooden causeway that connects the island to the mainland. Granite Island is popular for its colony of Little Penguins who make way to the island's shore at dusk. This wouldn't be a complete list of Adelaide tourist destinations without having at least one wine region on it! 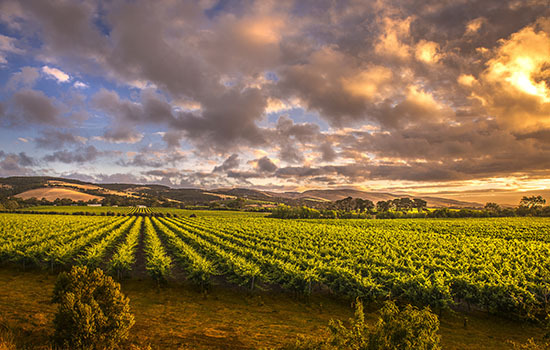 Our favourite is Barossa Valley which is just an hour's drive from Adelaide. The region is filled to the brim with some of the worldâs top wineries. You can take a guided tour of the vineyards or just drink fine wine and eat gourmet cheese to your heart's content. One of Australia's top destinations is just a 3 hour coach and ferry ride from Adelaide. 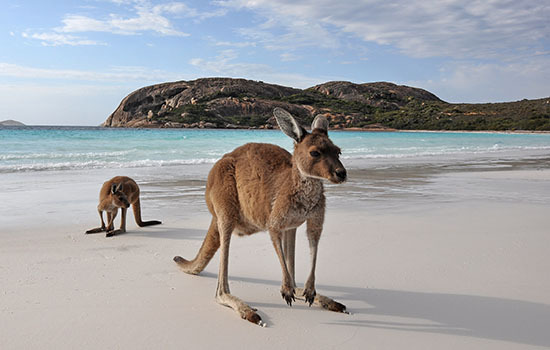 Kangaroo Island is a mixture of wild bushland and pristine white beaches. The island is populated with some of Australiaâs must renowned native animals. You can take a guided tour through the island and encounter koalas, sea lions, and of course kangaroos, in their natural habitat! If you can't make the trip out to Kangaroo Island, then Cleland Wildlife Park is a great alternative. The Park is just a 20 minute drive from Adelaide and homes a range of Australian wildlife such as kangaroos, wallabies, and emus. You can wander among them and hand feed the kangaroos. If youâre willing to pay a bit of extra money, you can even cuddle a koala! That wraps up our five favourite destinations around Adelaide! If you're a migrant who wants to call Adelaide your home, give our office a call on 1300 066 267 and we can walk you through your visa options. The good news is Adelaide is classed as a regional area which means if you're a skilled worker you could be eligible for the 187 Visa. Under this visa South Australian employers can nominate a skilled migrant for a permanent or temporary visa. These visas are also priority-processed; which means you'll get a decision from the government much faster than any other visa!